Trinidad and Tobago, an Island nation in the Southern Caribbean located just off the coast of Northeastern Venezuela and South of Grenada in the Lesser Antilles has a total land area of 1,981 square miles and a population of over 1.3 million. 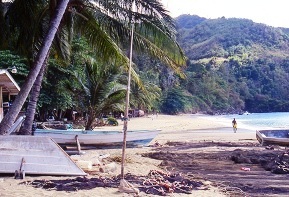 Mountains and plains cover the tropical island of Trinidad and Tobago. Though it is just a hop, skip, and a jump away from South America, it is part of the Caribbean Islands. It is an oil-rich country whose high-income economy is predominantly based on petroleum and petrochemicals industry. As the oil boom is predicted to end by 2018, the country is on a quest to diversify its economy. Ity is now a major offshore financial center. Tourism, agriculture and public service are showing rapid progress too. December to April is its tourist season. It receives more European visitors than from other continents. The major attractions are Fort George and Queen’s Park Savannah in Port of Spain, Charlotteville in Tobago, Bacolet Beach, and Caroni Swamp. Visitors tend to time their visit around Trinidad's Carnival, held before Ash Wednesday. It is on par with that of Brazil’s carnival. Its mouth-watering cuisine is another draw and reflects well its ethnic diversity – Indian, African, European, Amerindian and Chinese. Popular dishes are seafood of all kinds, roti, curry dishes, yummy festival dishes and various desserts. The Rough Guide to Trinidad and Tobago 978-1848365148 $15 A traveler’s introduction covering over 50 pages followed by region-wise coverage on Port of Spain and the Western tip, The North, Central Trinidad and the East Coast, San Fernando and the South, and Tobago. Trinidad and Tobago Travel Map by ITM Canada 978-1553417248 $13 1:150,000 Scale. The first stamps of Trinidad and Tobago were a set of six stamps released in 1913 depicting Britannia allegory. The set (Scott #1 to #7) is remarkably inexpensive and catalogs for around $20 mint and around $15 used. A variety of the same set was released in 1914 and that set included two designs of the Britannia allegory. The high-value set (Scott #8 to #11) is rare and valuable and catalogs for around $180 mint and around $290 used. Another variety in the two designs were released between 1921 and 1922 and that set (Scott #12 to #20) is also highly valued at around $120 mint and around double that for used. Issues portraying King George V and the Britannia allegory formed the primary stamp issues of Trinidad and Tobago during the period till 1935. Trinidad and Tobago was a Spanish colony until it was ceded to Britain in 1802. Trinidad and Tobago released a set of nine stamps between 1935 and 1937 showing local scenes. The set (Scott #34 to #42) catalogs for around $40 mint and around $45 used. The designs show Agricultural College, Mount Irvine Bay in Tobago, Discovery of Lake Asphalt, Queen’s Park of Savannah, Town Hall of San Fernando, Government House, Memorial Park, and Blue Basin. A set of five stamps released on August 31, 1962 to mark Trinidad and Tobago’s independence. The set (Scott #105 to #109) catalogs for around $6 MNH and around half that for used. The designs show Queen Elizabeth II (QEII) and new Terminal Building at Piarco Airport, QEII and Hilton Hotel, map and greater bird of paradise, and map and scarlet ibis. Trinidad and Tobago gained independence from Great Britain on that day. The country became a republic within the Commonwealth in 1976. A set of three stamps released on October 18, 1982 to mark the 25th anniversary of Tourism Board. The set (Scott #364 to #366) catalogs for around $4 MNH or used. The designs show Charlotteville, boating, and Fort George. Tourism is an important sector of Tobago but overall it is not as important a sector when comparing with other countries in the Caribbean. Oil and gas on the other hand accounts for 40% of GDP and 80% of exports. A set of four stamps and a souvenir sheet of two released on December 7, 1991 in the ‘Trinidad and Tobago in World War II’ theme. The set (Scott #534 to #537) catalogs for around $25 MNH or used. The designs show firing practice by Trinidad and Tobago Regiment, Fairey Barracuda Surprises U-boat, Avro Lancaster Returns from Bombing Raid, River Class Frigate on Convoy Duty, Supermarine Spitfire, and Vickers Wellington. A set of ten stamps released on February 6, 2001 showing Endangered Fauna. The set (Scott #612 to #621) catalogs for around $20 MNH or used. The designs show pacca, prehensile-tailed porcupine, iguana, leatherback turtle, golden tegu, red howler monkey, weeping capuchin monkey, river otter, ocelot, and Trinidad piping guan. The first coins of Trinidad and Tobago were Colonial Standard Coinage (100 Cents = 1 Dollar) Bronze Cents issued in 1966 showing Value in Obverse and National Arms in Reverse. The issues had very high mintage and generally catalogs in the dollar range for BU. The first gold coin was a 0.0988 troy ounce 100 Dollars Gold Coin released in 1976 showing National Arms in Obverse and Flying birds and value in Reverse. The issue has low mintage but still catalogs at a very slight premium over bullion value. Trinidad and Tobago has issued a number of commemorative coins and proofs over the years primarily for the numismatic market. Coins $1 and up Common UNC Cents starts around $1. Commemorative UNCs from the 1970s, UNC sets, etc start around $10. Large Commemorative Proofs from the 1970s, Silver Proofs from the 1970s, etc start around $25. Low Mintage Silver Proof Sets go into the 100s. Paper Money $2 and up Common UNC Dollar Banknotes starts around $2. Consecutive Serial Number UNCs with 5-pieces or more starts around $10. Dollar Banknotes from the 1930s and 1940s in VF+ starts around $30. UNC Bundles, Rare Dates, etc start around $50 and go into the 100s. Shell jewelry, sculptures, carvings, and calabash art are popular keepsakes from Trinidad and Tobago. Miscellaneous Collectibles $2 and up Pins, Patches, Collector Spoons, etc start around $2. Vintage Travel Ads, Posters, and Brochures start around $10. Handmade Painted Pottery Vases start around $50.